Part of my job is teaching older kids the skills needed to be a chef. There is lots of knife work, and practicing of basic skills. I’m always on the look out for recipes that are economical as well as those that contain as many different skills and ingredients as possible. I’ve used this recipe for several years because the topping is quick and easy, so that the kids can spend time learning how to make pasta from scratch. At home though, I often make it with dried pasta. 1. Prepare the pasta according to the packet. 2. Crumble the Feta cheese into a large bowl. 3. Slice the sun-dried tomatoes into thin strips. 4. Roughly chop the parsley. 6. 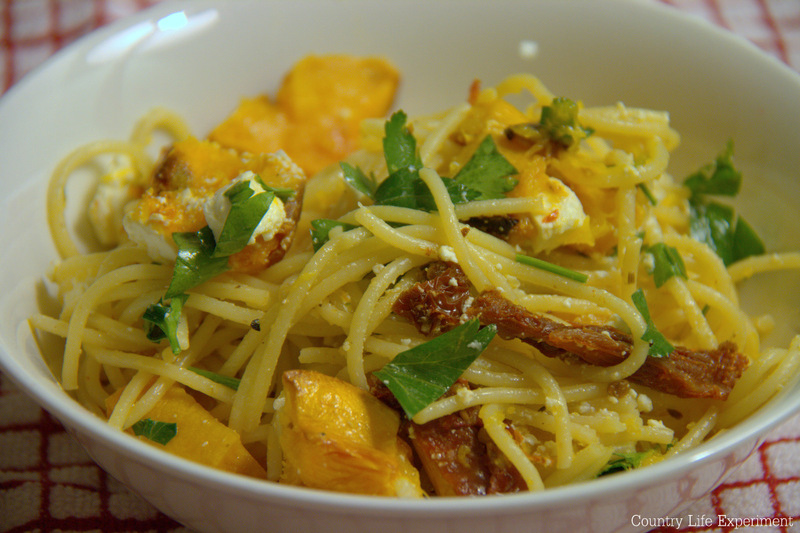 Place the feta, sun-dried tomato, and lemon zest in a bowl, together with the roasted pumpkin. 7. When the pasta has cooked, drain and toss into the bowl. 8. Dress with the olive oil and a big squeeze of lemon juice. Season with pepper and a little salt. Jo, while I was typing up my post tonight for the recipe of pumpkin and feta pastry triangles, I hope you don't mind that I put your recipe at the end of my post with this photo and a link back to here? Let me know if its not ok and I'll take it out. Its scheduled to go live just after midnight tonight. I've got pumpkin and feta on the brain too Jo. I made pumpkin and feta pastry triangles the other night for dinner. I've got an incy bit of feta left and its going with spinach for something. The pasta looks lovely. Welcome Michelle! Thanks for following along!